Tobacco is about to get a facelift. As a key ingredient in cigarettes, the plant contributes to gum disease, emphysema and cancer. This has led to a decline in cigarette sales and tobacco production in the United States over the past 25 years. But one research team thinks tobacco could provide a societal benefit by becoming a new source for biofuel. “All the things that make tobacco bad are really good for fuels,” said Bill Shelander, business development specialist at Lawrence Berkeley National Laboratory. 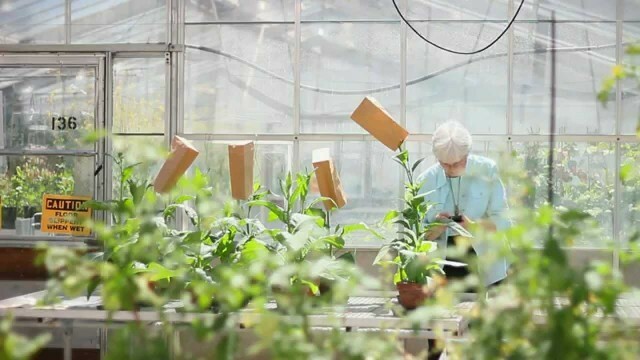 The lab has partnered with the University of California-Berkeley and the University of Kentucky to engineer tobacco so that its leaves produce oil that can more easily be converted into a fuel source for everything from cars to yachts. The project, called Folium, is backed by a $4.8 million grant from the Advanced Research Projects Agency-Energy or ARPA-E, a U.S. Department of Energy agency that funds the research and development of emerging energy technologies. The idea for biofuel — using plants as a fuel source — is nothing new, but it has gained popularity in recent years with rising gasoline prices and concern that burning fossil fuels is a main driver of climate change. The most common source for biofuel in the U.S. is corn, which is fermented and turned into an alcohol, called ethanol, that is added to gasoline and used to power automobiles. To create biofuel from tobacco, researchers have added genes from algae and cyanobacteria that can process sunlight more efficiently than corn does and convert the sunlight into hydrocarbons via photosynthesis. Hydrocarbons in the engineered tobacco are a form of bio-crude oil, an antecedent to fuel. 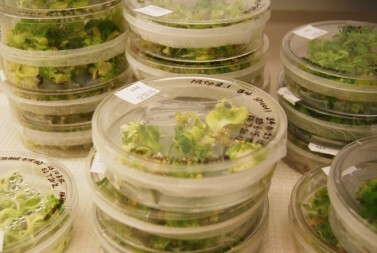 This bio-crude can be stored in the leaves and directly removed and processed to create biofuel, which requires fewer steps than making ethanol, the researchers say. Because less processing is required, at a commercial scale biofuel from tobacco could be price competitive with gasoline at three to six dollars a gallon, said Peggy Lemaux, a University of California-Berkeley biologist working on the Folium team. The plant has several other distinct advantages, said Lemaux. Tobacco doesn’t compete with the national food supply. It occupies 350,000 acres of land, compared to 95.3 million for corn, and is cultivated in designated areas where it has been produced for decades. It also can be harvested several times a year and it produces more biomass than traditional biofuel crops. Researchers at the University of Kentucky have been planting and machine harvesting tobacco on a two-acre plot to measure the potential yield. The tobacco biofuel has not been used in vehicles yet and would need more financial backing for testing after the three-year Department of Energy grant runs out this year. But critics say there are lots of problems with the idea. Pesticide pollution and inhumane working conditions are prevalent in the countries where tobacco is grown, said anthropology professor Marty Ortañez of the University of Colorado Denver. In May, Human Rights Watch, a nonprofit advocacy group, released a report about the dangerous working conditions for children as young as seven who work in U.S. tobacco fields. Many young workers were exposed to pesticides and nicotine that sometimes resulted in acute nicotine poisoning. Orlando Chambers, managing director of the Kentucky Tobacco Research and Development Center (KTRDC), said that tobacco used for biofuel would be machine harvested, making child labor a non-issue. “Conventional tobacco uses lots of labor, but genetically modified tobacco would be planted closer together and be machine harvested,” Chambers said. Ortañez contends that tobacco research, whether for biofuel or cancer vaccines, ultimately helps tobacco companies’ portray the industry in a positive light. Tobacco for cigarettes is picked by hand but tobacco grown for biofuel would be more efficiently harvested by machines. Photo: La Casa del Habano and Habanos S.A. When contacted, cigarette manufacturer Philip Morris declined to comment for this story. According to Folium biologist Peggy Lemaux, the research is neither supported nor influenced by the tobacco industry. Lemaux and other scientists participating in Folium have not received money from the tobacco companies, she said. 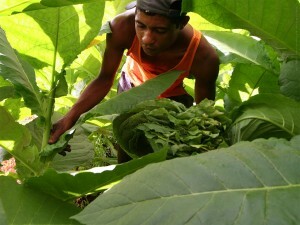 Despite the problems associated with tobacco farming, Ortañez does believe Folium has merit. If the plant can deliver the goods in these new and vital avenues, then toss the past in a trash can and get moving on a solid vision for the future.